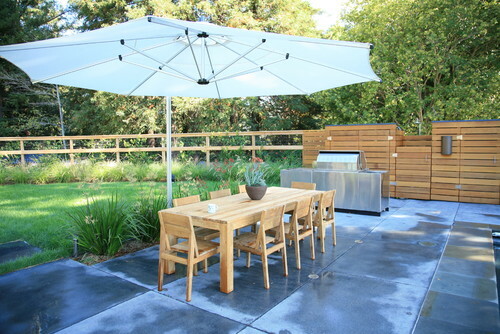 Beat the Texas heat with our favorite outdoor shade solutions! At AquaTerra, we’re always looking for ways to maximize beauty, utility, and comfort when designing your outdoor environments. Here in Texas, the summer sun is unforgiving, often lasting well beyond the season. Without adequate protection, what would be an otherwise perfect outdoor memory becomes downright miserable! Don’t let the sun’s harsh rays get in the way of any outdoor fun. Choose one of these outdoor shade solutions to create an inviting, pleasant outdoor space. Whether you’re dining al fresco with the family or entertaining a large crowd, the late-afternoon and evening hours are prime times to enjoy the outdoors. Heat from the sun can remain extremely intense well into the early evening. To make matters worse, the low angle of the setting sun can leave your patio roof or trellis completely useless. When choosing the location and layout of your outdoor space, be mindful of the sun’s angle and position throughout the day. If you’re short on space planning options, bring in shade-producing solutions instead. 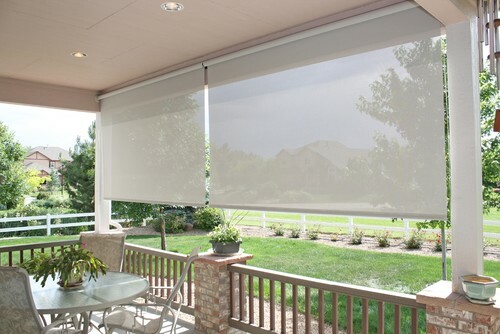 Roll down shades are a great option to ensure protection from the sun at any hour. Wood arbors are beautiful outdoor shade solutions but can limit design options and tend to weather quickly. You can dramatically increase your shaded area by mixing metal with wood. This industrial look allows you to take advantage of larger spans and cantilevers only possible with steel beams. For a light and airy feel opt for a durable, solid metal shade structure. We’ve all had bad experiences with the “big box” store umbrella. They blow over in a light breeze. The fabric tears easily and parts rust out quickly. After one season of use, most of those umbrellas end up in the trash. Consider investing in a custom-made umbrella with high-end metals and fabrics tailored to fit your space perfectly. These umbrellas can be designed to span 12-15′ in diameter and can be adjusted easily to accommodate the sun’s changing position. The cost for this type of product ranges from $3k-$10k, but given their durability and design flexibility, a custom umbrella may be the perfect outdoor shade solution. 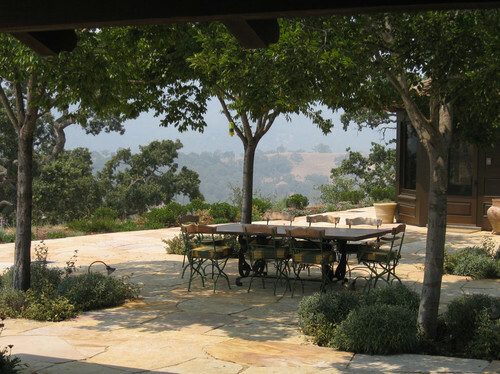 Stumped with how to shade your space without adding more metal, wood and plastic to your view? Consider planting a mature canopy tree in a strategic location. Trees are nature’s solution for shade and offer many benefits. They soften any outdoor space with natural elements, as opposed to man-made materials. Trees also provide a natural habitat for wildlife in your nature scape while increasing the amount of oxygen in the atmosphere. As if creating a beautiful source of shade and clean air weren’t enough, trees also cool the air by a process known as “’transpiration cooling”. Tree leaves release water into the atmosphere, cooling the surrounding air as the water transforms from liquid into a vapor. Pretty neat, right? !